HomeBlogThe BibleHow Does Salvation “Work”? In one Paul’s letters, he says something that is quite curious and strange. He tells readers to “work out your salvation” (Philippians 2:12). Ugh? Didn’t Paul also write that we are saved through faith and not by our “works” (that is, not of our own doing or striving)? (Ephesians 2:8-9). So, if we can’t earn our salvation, why do we need to work it out? Is Paul confused? Is he schizophrenic? Is this a paradox? Actually, I think it’s a matter of timing. First, we need to follow Jesus—by faith. We don’t need to do anything else to get God’s attention or earn his affection. There is no working involved in being made right with God. That means it’s a gift—we didn’t buy it and can’t earn it; it was given. The second part is our response. Out of sheer gratitude for the gift, we can opt to respond by behaving differently. 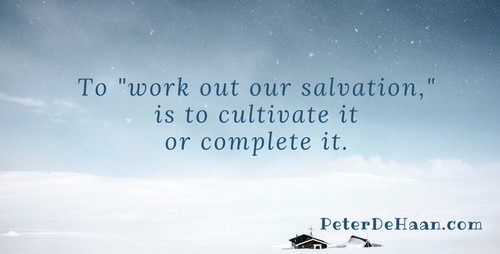 I think this is what it means to “work out our salvation,” that is, to cultivate it or complete it. Consider what if I gave you a million dollars. Would your attitude towards me change? I think so. You might want to find out more about me, learn why I did it, and maybe help me in my future philanthropic efforts. In essence you might be working out my gift to you. It’s still a gift, but one that evokes a grand response.